Do you know if critical files on your site are being changed without your knowledge? 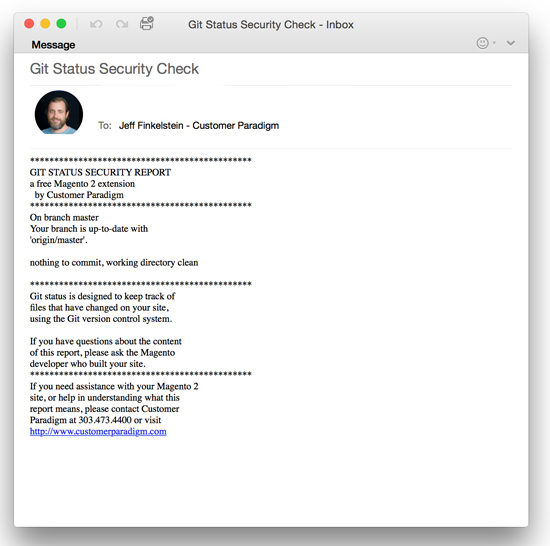 Customer Paradigm’s Magento 2 Git Status: Security Report is a new extension that allows you to find out if any files on your site have been updated or changed. It uses the Git version control system to keep track of changes to files, and will send you an email if anything was changed but not checked in. We’ve used this system to quickly detect intrusions on sites that have been hacked. It also allows you to know if developers are working on your site and not committing their changes properly in your version control system. Instead of relying on your customers to let you know that your site has been attacked and is stealing credit card data, this system will alert you right away if files have been changed. We’ve used this system on many of our Enterprise-grade eCommerce sites to protect them. We’re releasing this to the Magento community as a way to increase security and confidence in the Magento 2 ecosystem. Uses your Git version control system to keep track of changed files on your site. The system will email you if any new files are detected or if any files have been changed but not committed to Git. The extension has been designed to not conflict with other extensions, and work smoothly with Magento 2. You must have Git installed on your server, and your server must allow the script to run a Git Status command as a shell exec script. This extension was coded out by one of our top, certified Magento 2.0 developers on the Customer Paradigm team. The code has been peer reviewed by the rest of the department and tested extensively. The end user of your Magento 2 site will not see any part of this extension. If the Git Status extension does it’s job, your Magento 2 site will continue to run, without unauthorized changes to the site. On this page, you’ll select when the Git Status Magento 2 extension will run. Note: the Git Status report time settings will use the time zone that you set for your main Magento 2 store. Day of the Week: You can run the Git Status Magento 2 Report each and every day, or just on specific days (such as Tuesdays). How often should you run the Git Status report? 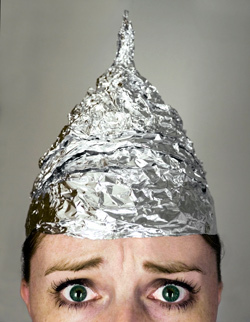 If you regularly wear a tin foil hat and are super paranoid, you can run the script every 15 minutes. You’ll get a lot of emails with this method, too. For example, let’s say your developer makes a change to the site at 5:00 pm on Friday, and then leaves for the weekend. But he doesn’t commit the changes to git. By Monday morning at 9:00 am, the system will have sent you 255 emails (One email every 15 minutes for 64 hours). This may impact your system performance – the git status can take up memory resources to run. It might also be an annoying way to fill up your email inbox. In this form field, you can set the FROM email address of your Git Status Report. Important note: if you add your boss to this email, and your developer has uncommitted changes, your boss will receive these emails. Don’t upset your boss with unwanted emails! Use this selection to determine if you want an email sent every time the Git Status script runs (i.e. every hour) or only if there are uncommitted changes to the system. Q: Will this work if I don’t use GIT? A: No. In order for this system to work, your site needs to use the Git version control system. And your developers must be checking in their work on a frequent basis. Q: I keep getting the same email saying that there are uncommitted changes to my site. Should I worry? A: What this means is that there have been changes to your file system since the last time someone committed their changes to Git. If you know that nobody should be working on your site, then yes – changed files may be a sign that there have been updates to your site without your permission. If any of the files are in the core directory, this could be a sign that something is off with your site. Q: I’m not receiving the git status emails. Why not? We also recommend having an SPF record that gives permission via DNS to send email on behalf of the domain. Beyond this, if your transactional emails are sending from the server (i.e. the order confirmation emails), then Git Status should be able to send properly as well. Q: If I see changed files, does this mean my site was hacked? A: Maybe. Or, perhaps someone on your team uploaded or changed files on the site. Or your server company did a security update. All this report will tell you is that files were changed on your site. Q: I uploaded a file to my images directory, but it doesn’t show up on the report? A: Most of the time, your image directory is not tracked by the Git file system. Specific file types or directories are set up in your gitignore file. This is done to help prevent the Git system from growing too large with large video or image files. Git normally just tracks your system files. If someone adds in bad files into a directory that is ignored by your git ignore file, the system will not be able to track the changes. Q: Can my site still be hacked with this script running? A: Yes, your site can still be vulnerable. 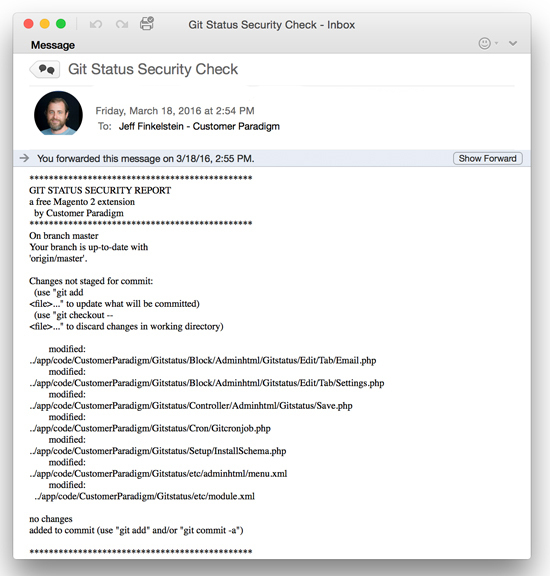 What the Git status script will do is alert you if any of the files in the system change. Unless your attacker is also committing files into your Git system (which we have not seen anyone do), then this will alert you, depending on when the script runs. Q: Will Git Status show folder or file permission changes? A: No. Git does not currently track if folders or files have permissions changed as part of their version control system. Git only keeps track of changes to the files. Q: I don’t have Git installed on my site. Can Customer Paradigm help me install git? Before using the extension in your Magento 2.0 store, it must be properly installed to notify your Magento site to the existence of the extension. If you have successfully processed these steps, you should now see the Magento 2 Git Status Security Report extension active in your admin area (displayed above). To ensure the extension has been disabled, please navigate to the back eend of the site and view the area. If the git status link in the admin is no longer showing up, your extension has been disabled. The Git status extension does add in an additional database table called cp_gitstatus_cron into your Magento 2.0 store. You may remove this table directly from your mySQL database.